Whether you’re an occasional emailer or an all-night binge-watcher, you’ll find an Internet service plan that’s just right. Plus add the Panoramic WiFi Modem: our fastest WiFi with 500k free Wi-Fi hot spots, 10 email accounts, and Cox Security Suite. All with a 30 day money back guarantee. 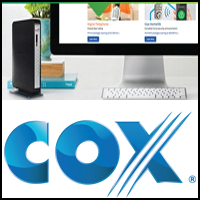 And The Employee Network members receive up to $100 bill credit plus “FREE install with qualifying bundle” for any new Cox service. Must click on “VIEW OFFER” and submit The Employee Network form.